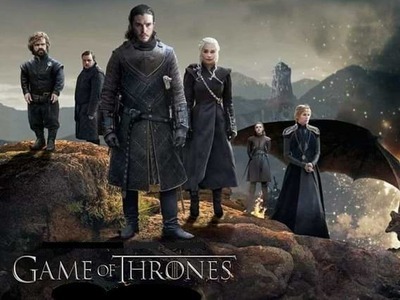 In the Seven Kingdoms of Westeros, where summers span decades and winters can last a lifetime, the Great Houses (Stark, Baratheon, Targaryen, Lannister, Greyjoy, Arryn, Martell, Tully and Tyrell) fight among themselves for a right to rule the Iron Throne. Beyond the Wall and across the Narrow Sea bigger threats are rising until its a right moment to take a revenge. Based on R.R. Martin's novels. 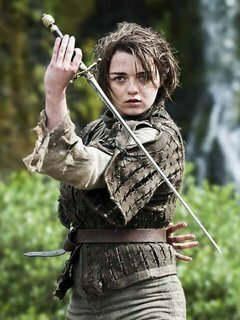 Lady Arya Stark (also known by a wide variety of nicknames) is the third child and younger daughter of Eddard and Catelyn Stark. 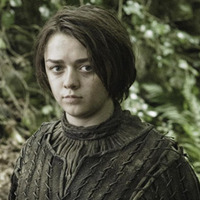 Throughout the story, Arya displays great resourcefulness, cunning, and an unflinching ability to accept hard necessity. At the beginning of the series Arya is introduced as a nine-year-old polar opposite to her elder sister Sansa—while Sansa is dignified and ladylike, Arya is wild and carefree. She often feels overshadowed by Sansa's accomplishments and notes that the only things she is better at than Sansa are horseback riding (of which she is very fond) and of mathematics. She believes she is not very pretty, with brown hair and the Starks' gray eyes, in contrast with Sansa, who takes after their mother. Constantly rebuked by Sansa and her governess, Septa Mordane, her closest relationship is surprisingly with her half-brother Jon, who also understands how it feels to be overshadowed. She creates a slight scandal in Winterfell by naming her direwolf Nymeria, after a warrior queen from centuries past. When King Robert arrives in Winterfell to visit her father, Arya tries to sneak out to view the men but is stopped by her parents. Before she leaves for King's Landing with her father and sister, Jon gives her a specially made sword as a parting gift, which she names Needle. On the journey to the capital, Crown Prince Joffrey Baratheon starts a fight with Arya when he tries to hurt her friend, a commoner named Mycah, and Nymeria attacks him to defend her. Knowing that the Lannisters will order Nymeria to be killed in retribution, Arya drives her away, and while she is angry that Sansa did not defend her when they are brought before the king and queen, she still begs the queen to leave Lady, Sansa's wolf, alone (the queen later orders Lady to be killed in Nymeria's place). Arya then begins to despise the Lannisters and Sandor Clegane, who killed Mycah when he tried to flee. Arya is still upset about the situation when she arrives in King's Landing. Her father discovers Needle and, after Arya tells him she was trying to learn how to use it, lets her study with the former First Sword of Braavos, Syrio Forel. Arya looks up to Syrio and applies his teachings to herself throughout the rest of the series. When her father is arrested for treason after King Robert's death, Arya manages to escape the castle, killing a teenage servant who tries to stop her in the process. She takes to living in the streets and killing pigeons for food until she sees her father publicly executed at the Great Sept of Baelor. She is found by a recruiter for the Night's Watch, Yoren, who knew Arya and her father. He cuts off her long hair to disguise her as a boy and pass her off as a new recruit, intending to bring her to Winterfell on their way to the Wall. Now known as Arry, she forms rivalries with but later befriends Lommy Greenhands, Hot Pie, and Gendry, three recruits all slightly older than her. Gendry learns of who she truly is after he accuses her of being a girl, but swears he will keep it a secret from everyone else. When the group is attacked by raiders, Yoren is killed and Arya, Gendry, Hot Pie, and Lommy manage to escape (Arya also frees three prisoners). They are all captured by men in the service of Ser Gregor Clegane, who kill Lommy and bring the other three to the Castle of Harrenhal to become servants. Arya begins to use the name Weasel and hopes to someday return to Winterfell. While she is at Harrenhal she also becomes an acquaintance of Jaqen H'ghar, one of the prisoners she freed on the Kingsroad. In exchange for rescuing him, he tells her he will kill three individuals she wishes dead. She names two servants at the castle before she realizes she should have picked higher-ranking people, preferably King Joffrey and his mother, before naming Jaqen himself as the third person. To avoid dying, he frees Stark bannermen who were prisoners at Harrenhal and leaves, but not before giving her a coin with "Valar Morghulis" engraved onto it ("All men must die" in Valyrian) and telling her to give it to any Braavosi across the Narrow Sea. She begins to dream that she is her direwolf Nymeria, who is still alive somewhere in the Riverlands, and becomes a warg like Jon and her younger brother Bran. She manages to escape Harrenhal with Gendry and Hot Pie and starts on her way to Winterfell once again. While they are on their journey they are captured once again, this time by the Brotherhood Without Banners (led by Beric Dondarrion) at an inn. Hot Pie decides to remain at the inn, because they need a baker. Dondarrion promises to ransom her to her brother Robb, now King in the North, and her mother. At his request, The Brotherhood knights Gendry and allows him to work in their service. They later capture Sandor Clegane, who had fled King's Landing during the Battle of Blackwater Bay. Arya accuses him of Mycah's murder and he is put on trial, but demands and survives a trial-by-combat and is released, without his gold. Arya attempts to flee from the Brotherhood but is captured by Sandor in the process; while he is initially harsh to her, he softens as they prepare to arrive at the Twins. They arrive during the wedding of Arya's uncle Lord Edmure Tully, but discover that Robb and Arya's mother have just been treacherously murdered by the Freys, and Sandor refuses to let Arya go in.